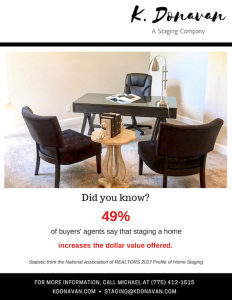 According to a 2017 study for the National Association of REALTORS, properly staging a home helps potential buyers visualize themselves living there, sells the home faster and for more money. Whether you are considering a full, partial or light stage, staging a home is imperative in getting top dollar for it. You want people to bid high and often, and a good looking home encourages that. 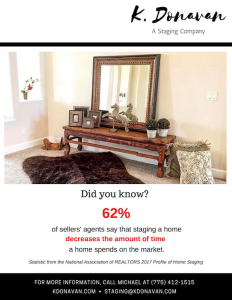 For Realtors, getting a professional staging can help to move the process along quickly and with fantastic results. It is why we do what we do. We know that a good looking home will make you and your clients happy, something we can and aim to achieve. 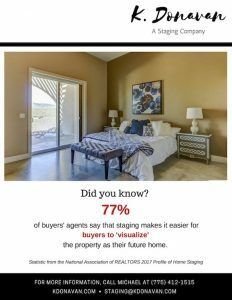 Call/text (775-412-1515) for your free staging quote.